For those of you who read our articles on a regular basis are now clearly aware that turmeric’s pharmacological efficacy is profoundly affected by its bioavailability / absorption. So turmeric is a revered herb not only in the field of traditional medicine but also in the field of next-generation drugs. The spice has over 100 compounds which have medicinal properties ranging from anti-inflammatory to anti-cancer etc. Curcumin is the principal bioactive compound of turmeric and most research is organized around it. Curcumin accounts for 2-5% of natural turmeric powder’s composition. So that means you have to take a large amount of turmeric powder to obtain an effective dose of curcumin. So what do you do next? You then think of taking 95% pure curcumin powder. But does that do the trick? Not really, right? Well, there are two reasons for it: one that Turmeric is more than just curcumin and the second is bioavailability. Bioavailability is how a nutrient gets detached from the food, gets absorbed by intestines, enters the bloodstream and reaches the target cells. This is attributed to poor absorption, active metabolism and rapid excretion from the system. Why doesn’t taking pure curcumin to solve the whole bioavailability/absorption problem? What are the possible barriers turmeric has to overcome before acting medicinally? How does black pepper help in increasing turmeric’s bioavailability? What is the role of fats in turmeric’s bioavailability / absorption? 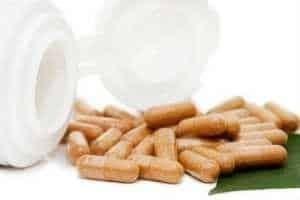 Time and again I have been saying that it is preferable to take natural turmeric than going for supplements. Here is one study which evaluates the bioavailability / absorption of turmeric and curcumin in terms of their immunomodulatory and anti-inflammatory property. In this study, rats were fed curcumin or turmeric as a part of their diet. Interestingly turmeric increased the level of pro-inflammatory agents better than curcumin diet, suggesting that turmeric is more bioavailable than curcumin. Another study demonstrates that curcumin when tested in an experimental gastrointestinal model, is almost zilch. However, the same model was used to assess the availability of tumerones and curcumin and this experiment proved that tumerones effectively improve curcumin’s absorption and protect it from drug-metabolizing enzymes. Tumerones are active constituents of turmeric oil. So I guess this answers the question. Turmeric as a whole is better than curcumin because turmeric oil improves the bioavailability of curcumin and has medicinal value. Sorry to burst your bubble, but no, taking curcumin powder alone will not solve the bioavailability / absorption problem. It has to survive the activity of digestive enzymes. It has to tolerate the pH levels of the stomach. It then has to be preferentially absorbed by the intestines. On being transported to the liver, it has to survive the activity of drug metabolizing enzymes. Finally, upon entering the bloodstream, it has to navigate its way to target cells. Black pepper contains an alkaloid called piperine which is proven herbal bioenhancer. Apart from giving the spice its pungent taste, piperine is known to enhance bioavailability of many drugs. You must be aware of the study that states that piperine at 20mg increases the bioavailability of curcumin by 2000%. Let’s find out how? Non-specific mechanisms: It may reduce the acidic content of the stomach to prevent degradation of the drug or it may increase the number of enzymes that support the absorption of drugs in the intestinal cell. Specific mechanisms: It inhibits the activity of the specific enzyme that supports biotransformation. The permeability of each cell is a function of many factors like the nature of the compound entering it, the enzymes present and the acidic or alkaline environment. This is the first defense mechanism that cells have to avoid an unnecessary invasion of foreign substances. Studies show that piperine alters intestinal permeability ( the mechanism by which drugs are absorbed by the intestine) in animal models. Gamma-glutamyl transpeptidase is an enzyme that plays a vital role in drug metabolism and transfer of compounds across the cell membrane (a thin coating around each cell that regulates entry and release of compounds in the cell). Piperine increases the activity of this enzyme to increase the permeability of intestinal cells. Piperine also alters the environment in the intestines such that it is conducive to absorption of drugs. It is absorbed rapidly across the intestinal barrier and it forms complexes with drugs enabling rapid absorption. It even changes the microscopic structure of the intestinal wall to facilitate better absorption. After being absorbed from the intestines, piperine and its partners basically the drug molecules are transferred to the liver where they undergo a series of drug transformation or detoxification reactions. They are 3 phases of detox and they mostly take place in the liver but can occur in other organs as well. Piperine inhibits the activity of phase I and II enzymes thus contributing to its bioenhancer activity. P-glycoprotein: It is an important protein that regulates the entry and exit of various compounds in the cell and also regulates drug resistance in cells. Cytochrome P450: It is a group of enzymes that oxidize drugs to facilitate rapid elimination from the body. Glucordination : Remember the compound curcumin glucuronide mentioned earlier. Piperine inhibits this phase II reaction. So it is definitely clear that piperine can effectively transport curcumin and turmeric across the intestinal barrier and protects it from drug metabolizing enzymes. Every time I consume turmeric does the pepper have to be freshly ground? Yes, the pepper has to be freshly ground. In India, peppercorns are stored and ground freshly. Also, they are added just in the end because excessive cooking may make it lose its flavour. Storage of ground pepper definitely makes it lose its flavour and we know piperine is one of the most important constituents of black pepper that imparts pungency and flavour to the spice. Ayurveda recommends taking turmeric with ghee, a type of butter and definitely there must be some reason behind it. Remember doctors always suggest taking medicines after a meal. That is because food plays a major role in the absorption of drugs. Lipid (fats and oils) is an essential component of food that enhances the bioavailability of drugs. Indians take turmeric as a part of curries which definitely have good proportions of oil. Lipids favorably affect four major processes of drug delivery within the body: solubility, dispersion, digestion, and absorption. Supports direct transport of the drugs to the bloodstream via the intestinal lymphatic system (biological system involved in immunity and detoxification of the body). This avoids the first pass effect or phase I detoxification. Various lipid-based formulations have been devised for curcumin such as liposomes, micelles, self-emulsifying systems, lipid nanoparticles, etc and these have to increase bioavailability 30 to 50 times more than unformulated curcuminoids. An experimental study reports that curcumin solubilized in an emulsion made from corn oil and water is highly bioaccessible suggesting the use of food emulsions (combination of oil and water) for drug delivery. Soyabean oil is also thought of as viable carrier that can increase curcumin uptake in the body. Curcumin in combination with emu oil is demonstrated to have strong anti-inflammatory effects and this is due to its increased bioavailability (5.2 times more bioavailable than the aqueous extract of curcumin). The reason behind quoting these studies is to inform you that you need not to go for sophisticated company manufactured lipid formulations of drugs. Simply cooking turmeric with oil should do the trick. 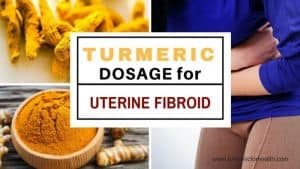 Fats / oils / Lipids have a different mechanism than piperine in increasing systemic availability of curcumin and turmeric but it definitely increases availability by several folds than unformulated turmeric. There are many ways to increase bioavailability / absorption of turmeric but the reason why we chose fats / oils and turmeric is that these are things you can do at home. If you have gone through the recipe of the Golden Paste you must have realized that it includes black pepper and oil both of which can make turmeric more bioavailable. 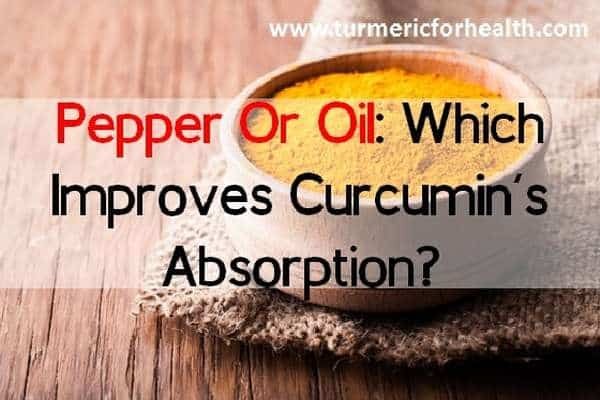 Due to the different mechanisms involved you can’t really judge which technique is better though commercial lipid based formulations claim to increase bioavailability / absorption by 30-50 folds than unformulated curcumin while pepper increases absorption by 20 folds. However, we will definitely update this section based on prospective research. But since you have access to an easy recipe of Golden Paste that synergizes the effect of oil and pepper as bioenhancers, why not make the best use of it!? I made a tincture of turmeric and a tincture of black pepper, combined them, and I take it daily. Will this suffice at making the curcumin bioavailable? Does cayenne pepper help with turmeric absorption like black pepper? Hi. According to current research, Cayenne pepper does not help improve turmeric absorption. Hi. Perhaps you are adding too much of black pepper hence the burning taste. Anyways you could skip the black pepper completely if it is not suiting you. If you plan on taking whole black pepper corns, 1 or 2 corns should suffice for 1/2 tsp of paste. Does ginger help with turmeric absorption? So…would turmeric with just ghee and/or coconut oil help with turmeric absorption or is black pepper needed for better absorption? Just curious. Also, would unsalted, grass-fed butter work for turmeric absorption along with black pepper? Hi. Yes if using healthy fats, you can avoid black pepper. Fats are sufficient for absorption of turmeric. Yes unsalted, grass fed butter works as well but avoid or limit intake of certain saturated fats. I have made a mixture of turmeric and black pepper 4:1 in a bottle ( 12 tsp of turmeric 3 tsp of black pepper ) I have 1/4 tsp of this mixture first thing in the morning with Luke warm water( put it on the tongue and drink /swallow with water ). Is it effective ? Is it the right way ? Hi. The combination is fine. 1/4 tsp daily may be slightly small amount. Increase gradually. Also turmeric is insoluble in water but is fat soluble. So either you can add this mix to your breakfast so that dietary fat in it can aid in absorption. Or you can make Golden Paste from this mix and take it daily. Or you cam make your own turmeric capsules as well. how much fresh ground pepper is recommended to use with the turmeric. spheric Vitamin C to the coctail. Both the Lipo curcumin and Vit C should be placed in a cup of cold water (2-ounces) and taken twice per day. Wait 15 minutes after taking before you eat. Does anybody have access to a Nanotechnology Lab ( maybe MIT) where “we” can expand on this. My blood results have shown a 20% decrease in IGA count every three weeks. i have been recently diagnosed with Multiple Myeloma. My emathologist wants to do “Autologus stem cell transplant”. As it involves Chemo therapy and considering that my levels are not extreemely high (Light chain Kappa 260 mg/L and % of plasma cell in bone marrow 10%) i decided to go for alternative therapy and namely Curcumin. 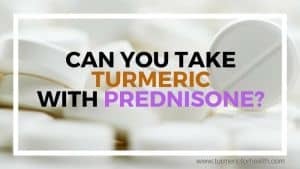 Can you please share your experience and mainly advise if the therapy was successful and how much of this success is due to Curcumin protocol alone: I am not planing to take Revlimid or Dex or any similar medication with it . Does therapeutic grade ,black pepper essential oil contain piperine and be used to aid absorption ? Black pepper oil does not contain piperine so it cannot be used to increased absorption of curcumin. pepparin improves/ enhances the absorption levels of any item we consume. Turmeric contains curcumin. Different varieties of turmeric contain curcumin from 2% to 8%. Turmeric containing higher percentage is good. , Turmeric dissolves in fat whether it is oil or some other fat. So to get best out of tumeric add both pepper and fat in one form or other. Black pepper are small black corns. They are spicy because of a compound named piperine that is required to absorb curcumin. We recommend using healthy oils. Olive oil will help. Another option is coconut oil. I have been using different forms of curcumin concentrate capsule imported from USA for my colon cancer. when I took pepperine curcumin I faced severe constipation. Hence, I switched over to other highly absorbable forms like theracurcumin. Turmaric / curcumin users should aware of side effect of pepper combination on regular basis. Fresh turmeric tincture is a great way of extracting curcumin and other compounds in turmeric which hold awesome health benefits. However whether it can be used on long term basis is still a question. have been taking turmeric tincture under the tongue, a few times per day along with 3-4 peppercorns, with liquid. Is this sufficient or should I go bigger, i.e., turmeric paste? Hi. This depends on what condition you are taking turmeric for. Both turmeric tincture and turmeric paste are great. Turmeric tinctures are beneficial in alleviating pain and inflammation. Turmeric paste has most of the compounds present in natural roots and as reported by readers it benefits in variety of conditions. 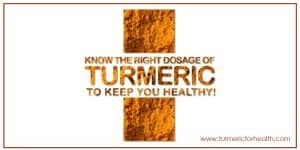 Turmeric tincture at a dose of 10-30 drops 2-3 times a day is recommended but you may confirm this with a herbalist. Not much is known about the absorption of turmeric tincture and whether there is a need to take black pepper with it. But yes black pepper also has health benefits. what about fresh turmeric tincture?? I had been making tumeric paste with coconut oil and grinding the pepper at the time I made up the paste. But I stopped adding the pepper into the paste (adding only cardamom, salt and ginger) and instead, when I add the paste to my soup bowl or sauteed vegetables – at that time I grind in a generous amount of fresh pepper. It sounds like the piperine is mostly what diminishes in effectiveness with time. Grinding enough pepper for the paste recipe is tedious, but when adding pepper to each meal it only takes 10-20 twists of the grinder and is less of a chore. Plus, the spiciness of the pepper is more powerful that way. It is hard to tell, but I think this is making my tumeric paste even more effective. I love it. Wow this sounds great. Thank you will try a mix of fresh from my garden turmeric and your other ingredients today. Thank you for sharing this point, Elissa. Can you tell me if it is ok to just swallow whole peppercorns with the turmeric , as I really detest black pepper and this is the only way I can take the black pepper. It is fine to swallow whole peppercorns. But its ok to skip the pepper in the recipe and use only fats …that should take care of the absorption. Once again I am not clear if Black Pepper Oil can be used in place of ground pepper? I put coconut oil and pepper oil (therapeutic form) in my turmeric milk. Black pepper fresh ground gets stuck in my throat so I switched over to a high quality black pepper oil. Please if someone has the answer to this let me know. Black pepper oil consists of compounds other than piperine. Piperine is the active ingredient of black pepper that is required to increase absorption of curcumin. It is ok to skip black pepper in the recipe and use only fats, they take care of the absorption as well.